Congratulations goes to Angela on being the lucky commenter for my Blog Anniversary. Please send me your postal details via my email, info@petalsandpatches.com so I can send you your prize. Sorry there is no picture of it, but the camera is being a little fussy at the moment, but I’m sure you will enjoy it. It is perfect weather here for stitching/quilting so happy stitching! Time has slipped by and it has now been 12 months (I’m just a litle late!) since I started my blog. To celebrate this milestone I am going to do a special mystery giveaway (or two). To be in the running to receive this giveaway anyone who leaves a comment over the next week on any of my posts will go into the draw. One or two lucky commenters will be chosen randomly and announced early next week. You have to be in it to win it!!! Best of luck! A while ago I showed you a sneak peak of a project I was working on for Creating Country Threads. Now I can show you the project. It is in the current issue Vol 11 No 1 that is out now. 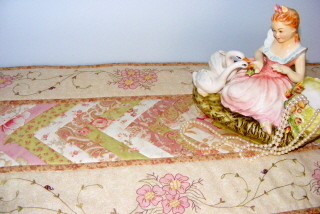 I do hope you like this table runner. In this issue is also an article on the Fresh Hope Quilt Project from Among the Gum Tree Designers. 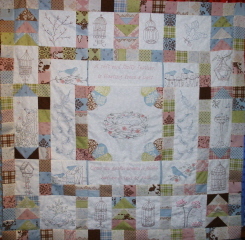 All the proceeds from the patterns for this quilt will be donated to the Fresh Hope Charity. Go and check out their blog Among the Gum Trees, they are a very clever and talented group. Well done girls! I’ll be back real soon with a special post! Say tuned for some more updates.